The characters in the long string of Marvel movies no longer experience amazement when encountering fantastic characters or events. If they can’t, why should we? 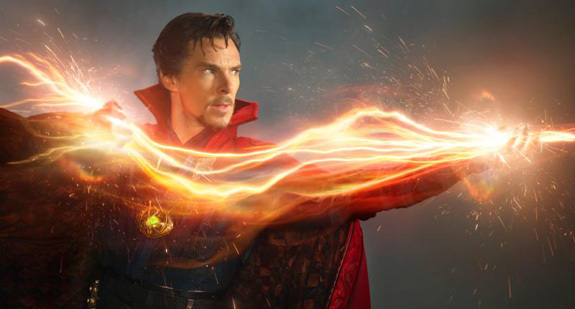 In a hospital in New York City, surgeon Christine Palmer (Rachel McAdams) is going about an ordinary day when suddenly, out of nowhere, her former lover and fellow surgeon, Dr. Stephen Strange (Benedict Cumberbatch), unceremoniously appears dressed like a wizard, and soon begins instructing Palmer, via his immaterial form or “astral projection,” how to do an operation on his physical body. Said astral projection then begins fighting another individual’s astral projection whilst she works. Sound wild? Not to Palmer. She seems a little stunned but generally rolls with the ebb and flow of this surreal episode, which would have any normal person—which Palmer is supposed to be—shaking his head in utter confusion and questioning his own sanity. A 12-page outline of the above sequence, complete with artwork, was what Doctor Strange writer/director Scott Derrickson used to convince Disney he was the man to bring this lesser-known Marvel property to the big screen. Such zeal for a project from a filmmaker is always great and made even better when the studio rewards that enthusiasm by hiring that filmmaker. Doctor Strange is a perfectly compelling piece of entertainment. The film also has the trademark levity we have all come to expect from the Marvel Cinematic Universe, but it breaks from the usual superhero milieu by dealing with more supernatural/paranormal themes of astral planes and Lovecraftian beings from dark realms, staying true to its slightly more obscure source material. You’ll laugh at all the jokes and be generally mesmerized by the Inception-style, mind-bending action. The story and characters are all compelling enough as well. You’ll leave feeling completely satisfied, even if you’re not totally able to recall what exactly the film was about the following day. Such has been my experience with many of the Marvel films of late: I always enjoy them, but can’t say any have made a lasting impression. And there is, alas, something important I feel missing: wonder. This struck me twice while watching Doctor Strange in the theater. Once during the sequence with Strange’s astral projection and Rachel McAdam’s Christine Palmer operating on Strange’s body, but earlier in the film as well. That moment was when Stephen Strange, a well-known and arrogant neurosurgeon, travels to a monastery in Tibet after losing full use of his hands, hoping to learn from The Ancient One (Tilda Swinton) how to restore his body and return to his life’s work. Strange—skeptical, modern man of science—learns the Ancient One’s technique for healing involves tapping into a spirit world. He quickly flies into a brazen assertion of materialism until, moments later, The Ancient One reveals the full scope of reality to Strange, sending his disembodied form blasting through different planes of existence in a rip-roaring and visually mesmerizing sequence. But this does not amount to a moment in which a man who has been, up until this point, committed only to the world he can see and touch suddenly has his views of the world turned upside-down. There is no real revelatory event or recognition that his entire life up until this moment has been an illusion. The sequence is a quick, entertaining, yet ultimately perfunctory segue into the rest of the movie. This might not amount to much more than a glorified nitpick of an otherwise good movie, so perhaps I should explain what exactly I mean by “wonder” and what I mean when I say it’s absent from Doctor Strange. There seems to me that there should be a moment in such a movie in which the film’s main spectacle, fantastic element, or amazing centerpiece is revealed to the characters in the film and marks their real entry into the world of the film. The magic or zeitgeist of the movie is suddenly visited upon the ordinary characters we identify with and therefore connects us, the audience, with a sense of wonder. A good example of this being done successfully would be the first Jurassic Park film, in the moment where the secret of the island park is unveiled to the main characters. Seeing a dinosaur for the first time ever renders the characters joyously speechless and we the audience are given emotional access to the characters and the world they are now in on-screen. Another example is in Richard Donner’s 1978 Superman film. Lois Lane dangles helplessly from a helicopter over the roof of a skyscraper as ordinary folk look up in terror. The character of Superman reveals himself to the “ordinary” characters in the movie here for the first time, and we, the audience, are introduced to an American icon on-screen for the first time in a new age of cinema. We believed Christopher Reeve was flying and our amazement was realized on screen in the ordinary onlookers who go from terror in the face of tragedy to excitement in the face of seemingly miraculous heroism. There is no moment in Doctor Strange in which the modern skeptic Strange (and perhaps the modern audience) feels deeply the implications of the larger unseen realities to which he has just awoken. We have no moment where this strange world of the film comes to break us out of prison of the ordinary. Perhaps the superhero genre is just now too proliferous and such moments are no longer possible. Or perhaps the “origin story” of the hero is now a ritual we must hastily move through to get to the good stuff. Maybe, in the case of Doctor Strange, the heroes of the previous Marvel films have become so entrenched in the world of the cinematic universe, the characters no longer experience amazement when encountering fantastic characters or events. If they can’t, why should we? Still, these moments are what often give films their resonance, and their presence makes the films more than special-effects montages or live-action cartoons. Doctor Strange is an entertaining movie and worth seeing, but let’s hope wonder can still be conjured up on the big screen. Andrew Svenning is a freelance writer in Southern California.